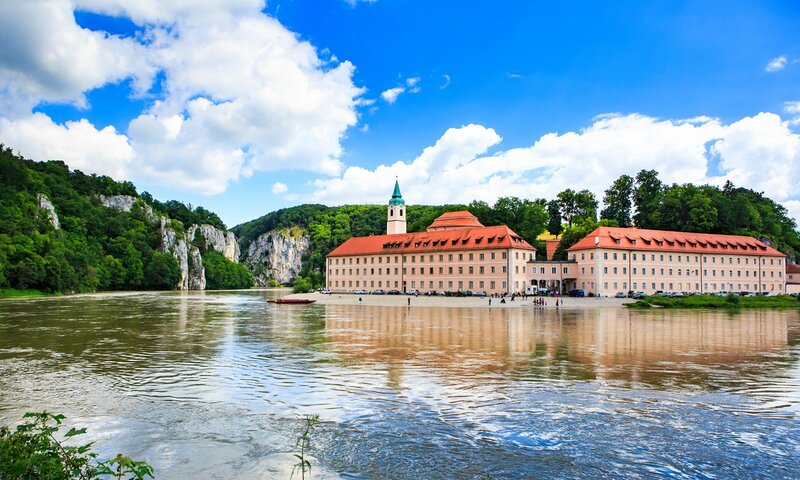 (P1) Weltenburg Abbey stands on a bend of the upper Danube, deep in a wooded gorge where the river cuts through the white limestone cliffs of the Fränkische Alb mountains, about 25 miles west of Regensburg in Bavaria. The abbey church, a spectacular concoction of late-baroque flamboyance, is worth the journey, but the main draw for most visitors is alcoholic rather than spiritual. The abbey houses the oldest monastic brewery in the world, which first started brewing in 1050 and produces a number of beers, the most popular being a dark, almost black, beer known as Kloster Barock Dunkel. It’s a lovely thing to sip in the beer garden in the abbey courtyard, accompanied by roast schweinshaxe (pork knuckle) and Bavarian dumplings, and is also available in bottles to take away. (P2) The abbey was founded in AD620, but the current buildings date from the early 18th century. The highlight is the interior of St George church, designed by late-baroque architects Cosmas and Egid Asam, with a combination of frescoes, stucco, and sculpture. Outside the monastery, there are great walks through the deep wooded gorge and into the surrounding hills. (P3) As there is no road through the gorge, visitors arriving by car must park in nearby Weltenburg village and walk along the riverside track. Much better, however, is to park on the quayside in Kelheim, three miles downstream, and catch one of the frequent boats that follow the winding gorge to the monastery landing stage. And if you end up overdoing the Kloster Barock Dunkel, there’s aways the option of overnighting in the monastery guesthouse (from €54 a night B&B). Describe the picture above of Weltenburg Abbey and it’s surroundings. Are you interested in going to this destination for a weekend getaway? Why or why not? Describe the architecture of a building in your country. What is the name of the waterway that Weltenburg Abbey overlooks? Beer in bottles can be consumed in the abbey as well as purchased for _________. Where can you sleep overnight at the abbey?